In the last 20 years of short term mission trips, each out of country experience has included a cultural day/tourist day. There can be mixed emotions from some of your supporters, as well as team members regarding "fun sight see-ing" trips in a mission trip itinerary. These are built in because in reality some people will only get to a foreign country once in a lifetime. What a great opportunity to experience all the the country and culture has to offer by adding to the experience with a local cultural experience. Africa was no exception and it certainly did not disappoint! I honestly can say that as we were preparing to leave Fiwagoh to head out on the "tourist" portion of our trip, I was sad. At the time I thought I could do without the safari and the tourist portion of the trip, that I would rather stay at the orphanage for those last two days!! However, I found that after a good nights rest I very much enjoyed (as I have in trips past) the tourist portion of Africa. I was so blessed to do a few sight seeing things, that are specific to Africa, and if any of these items you read about below, are not on your bucket list, you may want to reconsider!! Our safari started early on a foggy Friday morning before sunrise. Our safari driver David was prompt in pick up but was certainly having some struggles as we started off. The poor guy had his window stuck in the down position (for the entire day) and at some point prior to our departure, had his drivers door break, so he was unable to get in and out on his side of the vehicle. He kept a great sense of humor about the situation, and we were an encouraging group to hang out with, so we helped him put the top of the safari van up and down, and made sure to ask if he needed anything when we would leave the vehicle. The day was not only foggy but cool. It was after all winter in Africa! We began our journey at the Nairobi National Park. While the fog hung to the ground the images in the distance looked like apparitions, but were clearly the outlines of safari animals. Ostriches, vultures, and some rhinos in the very far distance! As the morning fog lifted, we were able to witness up close many other species of animals. While sadly, the "big cats" evaded us in a very stealthy manner, here were some of the amazing creatures we did witnessed up close! We spent many hours riding in our raised top safari vehicle scanning the horizon for the wonderful creatures that we currently had only seen online or in a zoo here in the states. 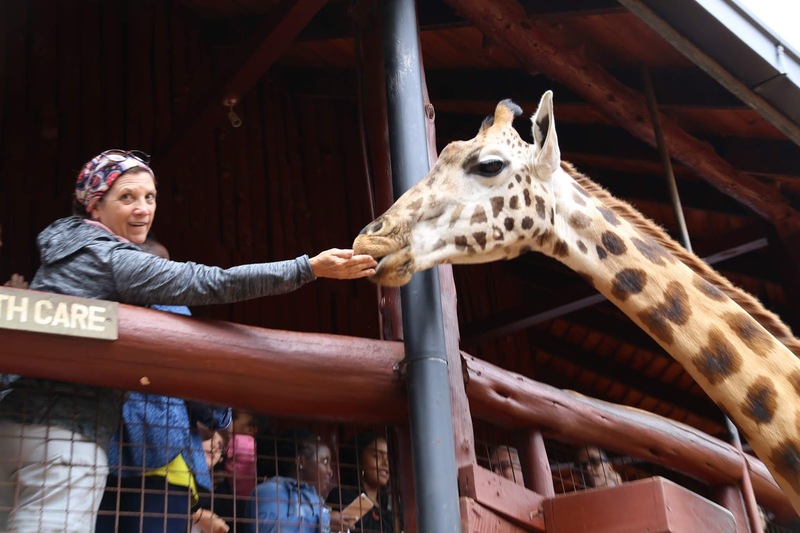 I will not lie, I was disappointed that I did not get to see any big cats, but I fell in love with zebras, and the beautiful birds and of course who doesn't love a giraffe or four! 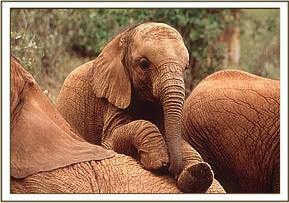 As our safari tour concluded, we discussed the David Sheldrick Wildlife Trust, Elephant Orphanage. They provide for a small fee, a "show" one time a day, for one hour, where they bring out the elephants and share their stories. All of these elephants have been rescued from a situation that would otherwise have lead to their death in the wild. Elephants that have been trapped, left behind after being separated from the herd, or their adult parents killed due to poaching of ivory, were just a few of the heartbreaking stories of these elephants. 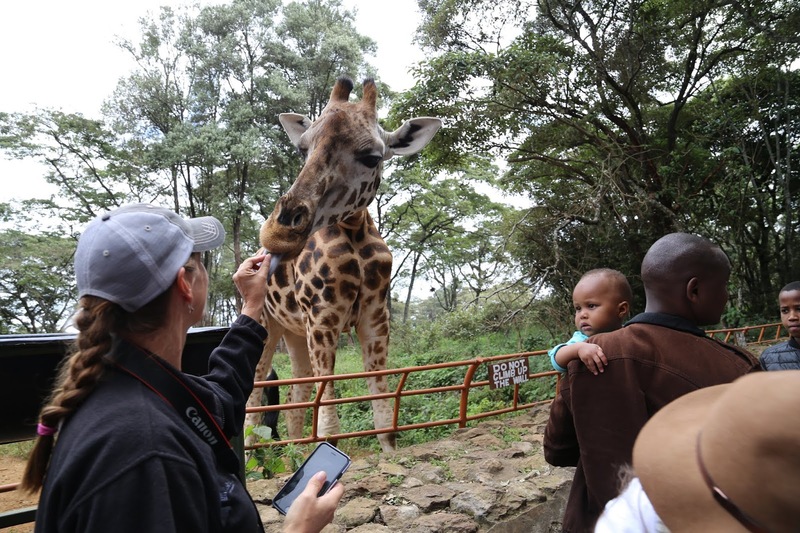 During the hour of the open visit, tourists stood around the outside of a dirt arena, cameras poised to catch images of these huge, gentle, and fun loving animals. One of my favorite parts was when the animal keepers started to feed them from the bottles! After years of working to diligently reproduce the formula of a mother elephants milk, the orphanage has mastered the combination, which is mostly made from human baby formula. These little one's certainly enjoyed their breakfast the day we were there! Another fact of interest that I gleaned while at the orphanage, is way that farmers are currently helping keep elephants from getting snared in their fences. (Some of the elephants have been caught up in fencing and injured as they attempt to raid farmers crops.) There are several initiatives in Africa, for bee fencing, as it seems that these large animals are deathly afraid of little tiny bees! They are so afraid that they have a special "bee alarm" sound that they emit if they are fearful that they are around bees. 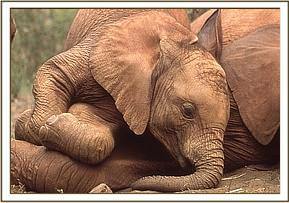 Those pesky little bees really sting the elephants in sensitive parts, their ears and trunks! Bee fencing costs between $1- $5 us dollars per 100 meters (328 feet) to install. When the elephants are headed to the fields to graze, they hit a sting that has nests attached, releasing the bees and causing the elephants to sound their alarm to the entire herd, and they all run away, saving the farmers crops. Between their grazing and their heavy stampeding feet there is nothing left of a field once it is trampled by elephants! Amazing that some bees are all it takes to sound the retreat! Each elephant at the orphanage is named in a way that is associated to the location or the situation in which the Wildlife Trust rescued him or her. "Estimated to have been born in April 1999, this female calf was about 4 months when rescued from a well on the Namunyak Group Ranch North of Lewa Downs. Her family had struggled all night unsuccessfully to try and retrieve her, but had to leave when tribesmen and their cattle turned up. She endured a rough ride in a lorry before being flown first to Lewa Downs Airstrip and from there by Charter plane to Nairobi. She is named "Edie" by special request of the Craig family who own Lewa Downs Ranch, to honor the memory of one of their donors named "Evie". The closest Samburu word we could find to "Evie" was "Edie" which means "over there" and with the approval of the late Evie's family, we thought this more appropriate. For many weeks Edie suffered from deep depression grieving for her lost elephant family, and was very sore and bruised from her fall, able only to lie on one side of her body for more than a month. In all other respects, she was not in bad condition and tender loving care from both the Keepers and the other elephants soon made her happy again." A monthly summary highlighting events of the previous month together with a direct link to the ‘Keepers Diary’ for your elephant. 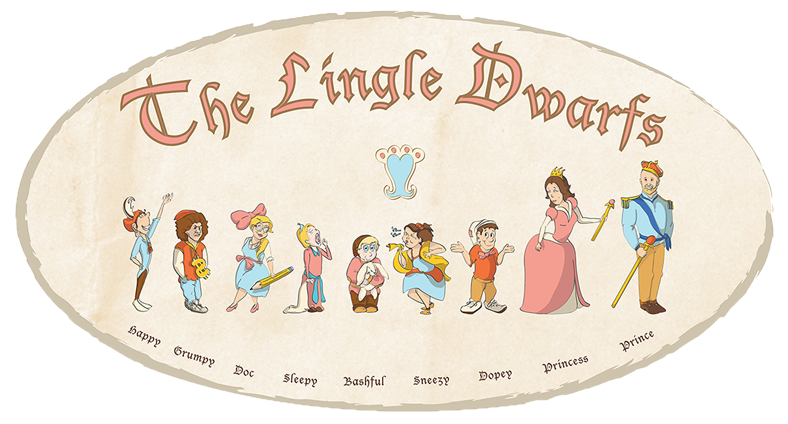 In the diary you will be able to access the daily calendar entries and the monthly photos. 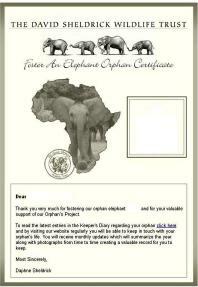 These updates can be printed off to enable you to keep a journal highlighting the progress of your orphan;. And most importantly, as one of our foster parents, you are considered part of the DSWT team and we will be keeping in personal contact with you as an important member of our project. Our time at the elephant orphanage was short but oh so sweet! 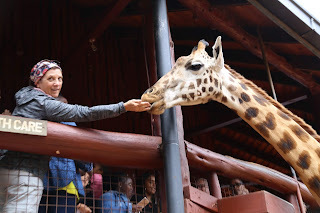 If you are interested in more information, follow this link : David Sheldrick Wildlife Trust While our time at the orphanage was too short in my opinion, we had one more stop to make! Next stop the giraffe sanctuary! 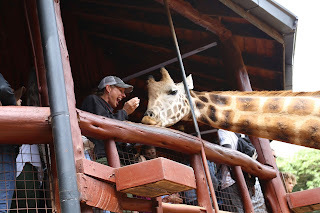 We headed to the Giraffe Center, part of the African Fund for Endangered Wildlife (Kenya) LTD. Now I am not sure what I thought it would be like to "feed a giraffe" but I got my treats and climbed the stand to wait my turn. While that turn never really happened I did have a giraffe's attention later on the ground. 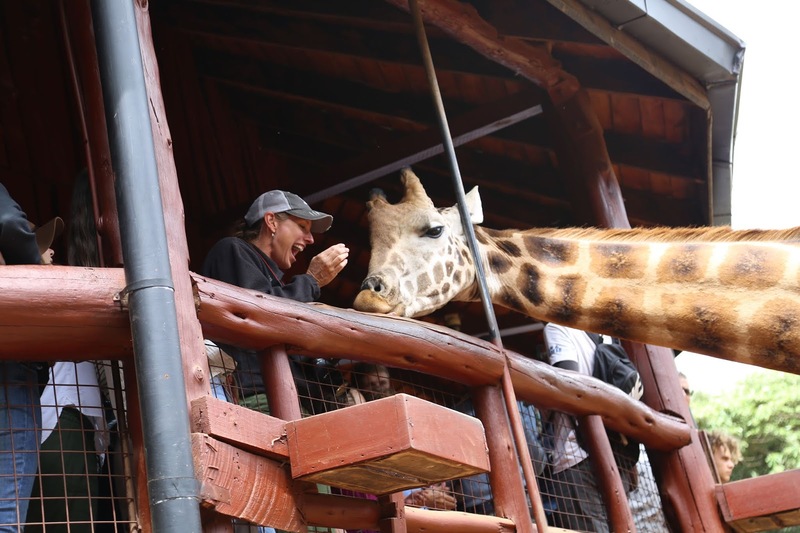 Here are some photos from the team's adventure in feeding these amazing animals. If you are planning a trip to Kenya book mark this website for the sanctuary details, Giraffe Center in Kenya . I so enjoyed seeing so many different kinds of animals up close on this trip. I am not sure if I would ever tire of seeing such amazing creatures roaming free or in sanctuaries if I lived in Africa. The way that God created them is fascinating, and sometimes scary. But again reminds me how diverse He made the world that we live in and all that is in it! So glad that I had this adventure and that You can't make this stuff up! I am a full time mom of 7. My husband and I are high school sweethearts, married for over 23 years and together for over 26 years. Pull a chair up to my #12FootTable, and let me share a story or two with you, that gratefully, I just can't make up! It's all about the Maize!